Esther and Her Family Rehoused! We’re really happy to hear that Esther and her family are being rehoused by Metropolitan housing association in their local area. Esther, ourselves, and Lambeth Housing Activists confronted Metropolitan last week about making the family homeless and demanded that they fulfil their duties as a so-called ‘social landlord’ and rehouse the family locally. By their deadline of Friday, Metropolitan had been in contact with Esther to offer her a choice two flats in the local area. 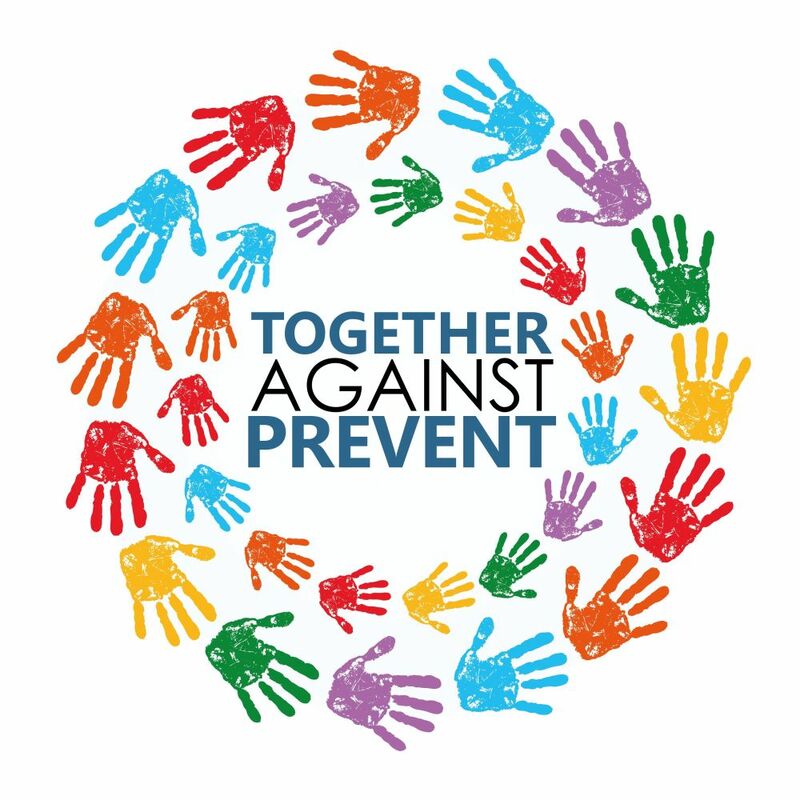 Collective action works! A massive thanks to everyone who supported Esther. Let’s keep on organising together for quality, secure, truly affordable homes for everyone! We met Esther when she was at Lambeth housing office on Brixton hill being told her and her family would have to live in temporary accommodation across London in Hackney away from their school, work, and community. HASL members accompanied Esther in the housing office to challenge them about this completely inappropriate accommodation. There we were told that homeless people and families are being sent to temporary accommodation in Enfield, Dagenham, and Margate. Others on the Clapham Park estate are facing eviction by Metropolitan as part of their regeneration scheme – a similar story is happening on other estates across Southwark and Lambeth. Join us at our regular meetings to discuss what we can do together about these issues and any other housing or welfare issues you’d like to take action on. Our next meeting is this Thursday 10th at 12pm at Southwyck Community Hall on the Moorlands estate off Moorlands road. We will be leafletting at Olive Morris House just up from Lambeth town hall on Brixton hill beforehand from 10am if you’d like to join us. This entry was posted in Our stories and tagged action, Clapham park estate, Metropolitan housing, protest, social housing, success on April 7, 2014 by housingactionsl. Today, Housing Action Southwark and Lambeth and Lambeth Housing Activists joined Esther to make a public complaint to ‘social landlords’ Metropolitan housing who had made her and her family homeless. Below is a cross post from People’s Republic of Southwark of the protest. Metropolitan have promised to find her alternative housing in the area by this Friday. We will be making sure they keep to their promise! Massive thanks to everyone who came along to show support today! Housing activists protest against Metropolitan Housing Association which callously evicted a pregnant mother from her home in Clapham Park. 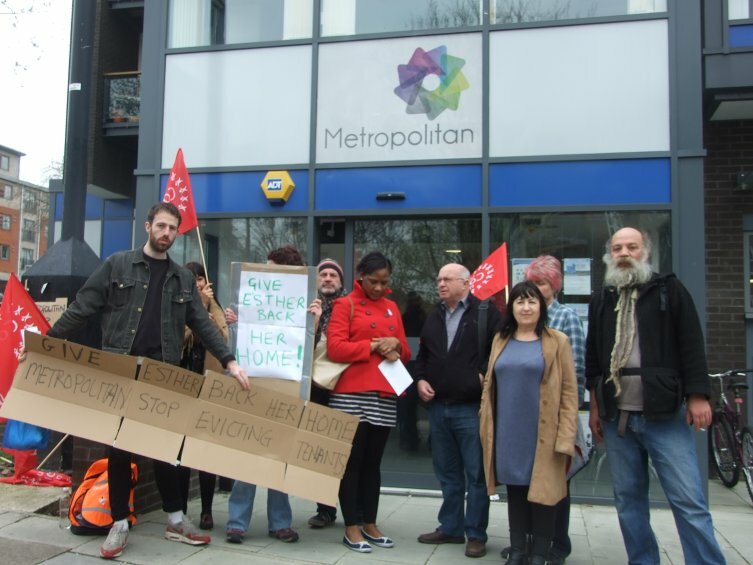 Earlier today, a dozen or so housing activists gathered outside the Metropollitan Housing Association office on New Park Road (Brixton/Clapham), in protest against their eviction of Esther and her family. We all joined Esther and collectively went into the reception area, demanding to speak with a senior manager, asking they urgently find Esther a new home in the area. One of the managers was refusing to take any responsibility for Esther’s situation, and initially refused to have the discussion at all, saying they would speak to Esther alone and no one else. This wasn’t acceptable, as it was important that whatever Metropolitan had to say, they did so in public, in front of witnesses. Metropolitan staff withdrew into their offices, refusing to discuss the issue publicly. After a bit of a stand-off, three activists went in with Esther, to talk with the housing association managers. While we waited for them outside, it transpired that another Clapham Park tenant was there too, with his young son, and that he too, and his family, were likely to be evicted soon, unless Metropolitan were held to an account and started acting as responsible landlords towards their tenants, regardless of their tenure. Passers-by stopped to talk, found out what was happening and many expressed their shock and outrage at both the Metropolitan actions, as well as the London housing crisis. At some point the alarm at the housing office went off by accident and shortly afterwards a police car, then a mini van, stopped outside. The three police officers who stopped to ‘chat’ with the protesters were all fully kitted (with taser guns at their belts). They soon left and then one of the Metropolitan staff locked the automatic door, preventing not just the protesters going in (which we, by that time, had no intention of doing) but also anyone coming out. A couple stopped outside the entrance to the office, waiting to be let in, and told us of their six or seven years of fight against the Metropolitan – for some six or seven years, they’ve been trying to get Metropolitan to do the necessary repair work on their home and Metropolitan continued to fail to do so. They took it to a solicitor and it is only now that Metropolitan is starting to negotiate a compensation, which, right now, is, as far as the couple in question is concerned, is a pitiful under-estimate for the damage they caused. The wife’s mental health suffered greatly precisely because of the ongoing struggles, so much so in fact that she is now in a refuge in Kent. When Esther and her supporters eventually emerged from the meeting with the Metropolitan manager, the activists reported, shocked, that the manager started off by claiming they were under no obligation to rehouse Esther (which, considering Esther was pregnant and with a young child, may not be actually true). When asked if this means people should refuse to leave their homes, she replied, ‘If they do that, we’ll just carry them out’. However, Esther managed to get some reassurance and a promise that Metropolitan would try and find an alternative home for her, in the area, by Friday this week (4th April). Activists promised to be back at the Metropolitan Housing office if this doesn’t happen. The real concern over the responsibilities of housing associations remain, as local authorities continue to pass their own housing duties onto housing associations, which, in turn, are increasingly behaving like private landlords – we had recently seen Notting Hill Trust (incidentally coming to the Aylesbury soon!) try to impose huge rent increases to residents in Bermondsey, while, just like Metropolitan, being a bit shy when it comes to maintaining and repairing people’s homes. You can see more photos from today’s protest on our Facebook page. For more information, please check Lambeth Housing Activists and Housing Action Southwark and Lambeth websites. This entry was posted in Uncategorized and tagged Clapham park estate, Metropolitan housing, protest on March 31, 2014 by housingactionsl.